Here we have an apples-to-oranges showdown. I had the opportunity to spend a week with two trucks and compare them side by side. 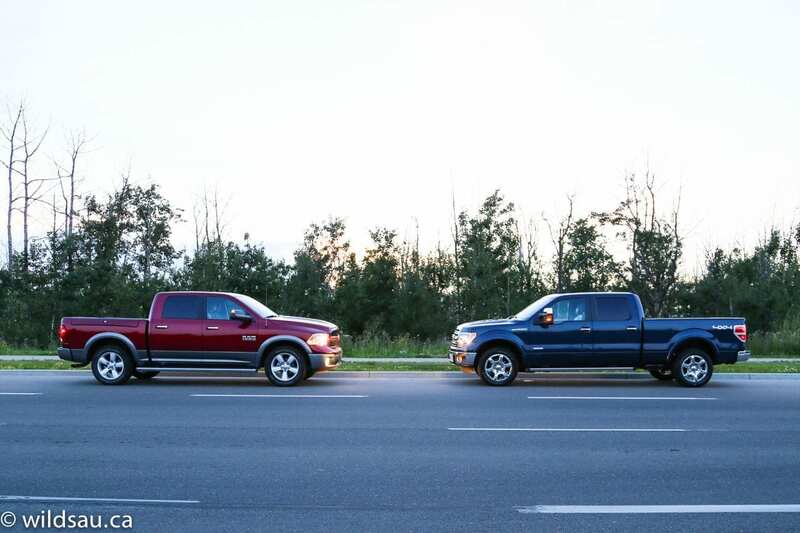 They’re both fierce competitors – Ford’s F-150 has been and continues to sell in droves (they moved over 100,000 F-series trucks in Canada last year) and the Ram is relentlessly picking up sales steam as of late. Unfortunately, they weren’t direct competitors here because of the drivetrains, but it was a great chance to see where the companies are coming from these days. If you’re looking at the competition, here’s my review of some 2014 GM trucks. If you’re shopping for half-ton trucks these days, the choices in trim levels alone are dizzying. 11 different Ram 1500 models and 10 different Ford F-150 models. To save you the boredom, and the half-hour likely required to cover all the options, I had a Ram 1500 Outdoorsman, which is about middle of the line in terms of trim, but uses the entry-level Pentastar engine. The F-150 I had was the Lariat EcoBoost, which is also middle of the line for trim but has an optional upgraded engine. Though it’s an underdog here, the Ram’s 3.6-litre Pentastar V6 is nothing to sneeze at. It puts out a decent 305 horsepower at 6400 RPM and 269 lb.ft of torque at 4175 RPM. It’s paired to the new 8-speed automatic which allows the truck to realize relatively decent fuel economy (relatively, I said!). Ram makes a big deal about it on TV and on the billboards everywhere. The rated fuel economy is 13 L/100 km in the city and 8.5 L/100 km on the highway. I thought it would be laughable to try to achieve that, but I was shocked to see myself average 14.1 L/100 km over the course of the week. Shocked because that’s really good. 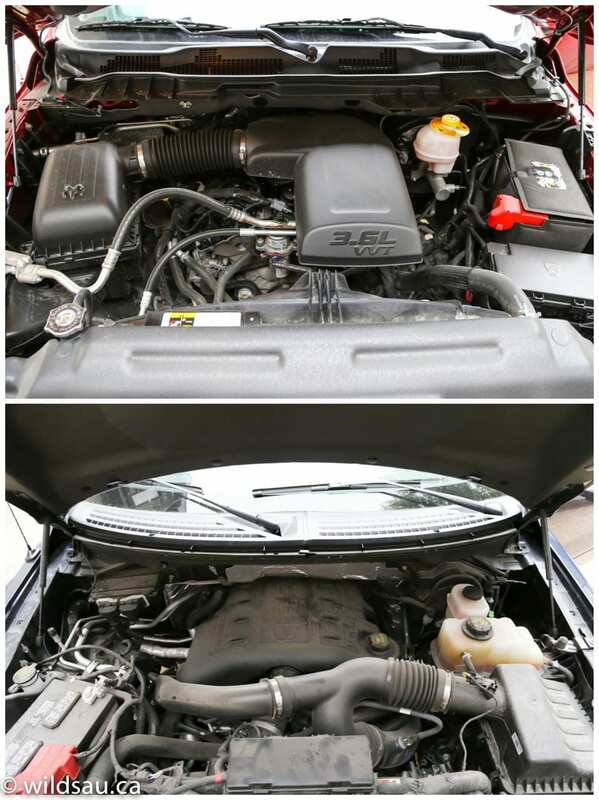 Ford’s EcoBoost, an exercise more successful in marketing than in practice, gives you a 3.5-litre twin-turbo V6. On paper, the difference is immediate. 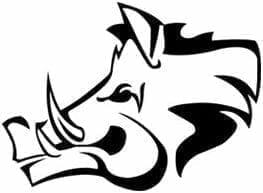 The force-fed engine churns out 365 horsepower at 5000 RPM, and more importantly, a massive 420 lb.ft of torque at 2500 RPM. Ford’s automatic, being a 6-speed, is a couple of gears short of the competition. The EcoBoost’s fuel economy is rated at 14.1 L/100 km in the city and 9.6 L/100 km on the highway. My average was 14.6 L/100 km over the course of a week. That’s impressive for a half-ton truck, thanks to some modern drivetrain elements. The Ram’s fuel tank holds 98 litres. The F-150’s doesn’t mess around – it has a 136 litre tank. 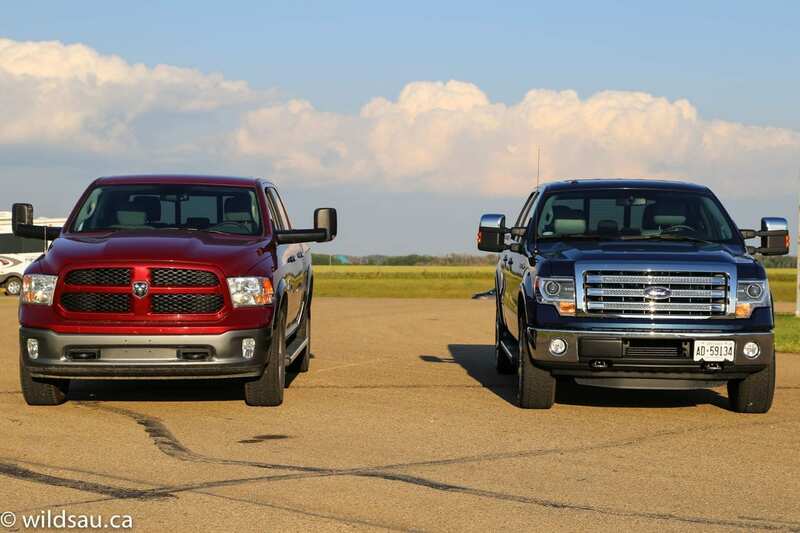 Both trucks were subjected to a significant amount of city driving as well as a highway towing test. The one difference is that the Ford also covered an additional 330 kilometres on the highway, which gave it an opportunity to bring its average down. 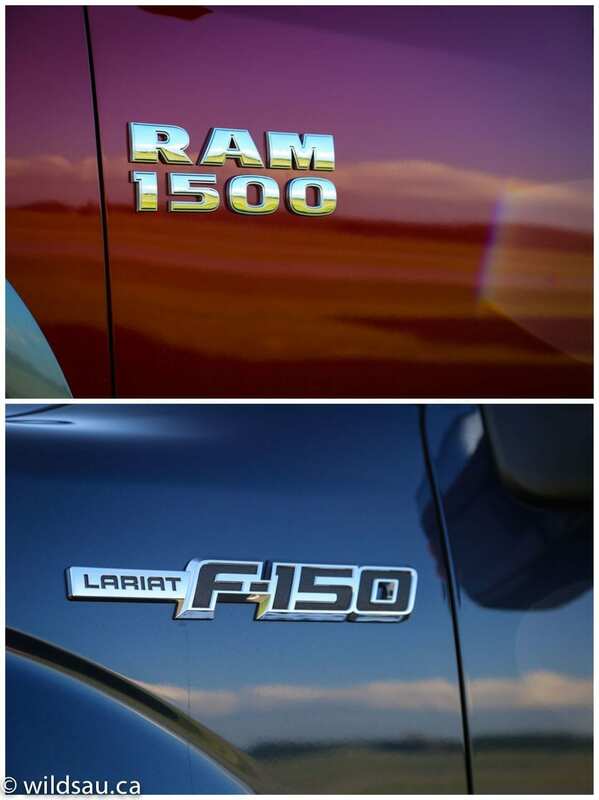 Ram advertises the 1500 as all-new, but I’d say the changes are incremental. The look has evolved but realistically, you can easily trace it back to the “little big rig” design that debuted 20 years ago. It’s not a bad looking truck, but in my opinion, the design is starting to get tired. The distinguishing characteristics are the lower front fenders that give a nod to big rigs and the backwards slanted grille. I have always liked the wheels on Rams, and the 20-inch rims on this one are no exception. They’re shod with fat 275/60-sized rubber. Though the F-150 isn’t a real head-turner either, I prefer the less aggressive and classier look. The lines are cleaner than the Rams, and are less likely to garner a second look. Maybe it’s me being an old man, but I like the smoothness of the current F-150 over the “I WILL race you” look of the Ram. The Lariat trim adds some chrome options and slick HID headlights. The 20-inch rims aren’t as nice as the Rams and are wearing similarly-sized 275/55 boots. I found the fit and finish in the Ram to be reasonably good. Plenty of hard dark plastics make it a bit gloomy and overall, the interior in this trim came across as more rent-a-truck than luxurious. The heated fabric seats were comfortable, but felt cheap. Only the driver’s side is power-adjustable. There’s a nice heated steering wheel with buttons for cruise control, the driver information screen, manual top gear lockout, voice recognition and the phone functions. Behind it sits a set of traditional gauges with a very large driver information screen between them. The driver information screen covers a lot of information – trip meters, instant/average mileage, numerous digital versions of the gauges, audio, trailer information, engine hours, oil life, air suspension, tire pressure…. phew! The screen is very sharp, easy to look at and well laid-out. The center stack sticks out a bit, making it easier to reach. On the left side is the rotary gear selector knob – a strange concept at first, but I appreciated how it freed up real estate on the console. At the top is the beautiful Uconnect head unit, an intuitive and well-organized hub for the media, nav system and phone. It’s very responsive – one of the best on the market. There are a couple of knobs to control it – otherwise everything is done by voice or touch. Below it is a climate control system – strangely, it’s not automatic and only offers a single zone. I really appreciated the 115V household plug on the dash. The leather seats are very comfortable and like the Ram, offer virtually no bolstering. They look upscale and both sides are heated, cooled and power-adjustable. The steering wheel is less complex than the Ram’s. It has controls for the driver information screen, cruise, the media system, handsfree and the phone. Similarities continue behind the steering wheel where you’ll find traditional gauges separated by a driver information screen. The screen isn’t nearly as big as Ram’s and feels more crowded. It also handles a lot of information along the same lines of what the Ram does. The F-150’s center stack is flat, and I found it to be a bit of a reach sometimes. 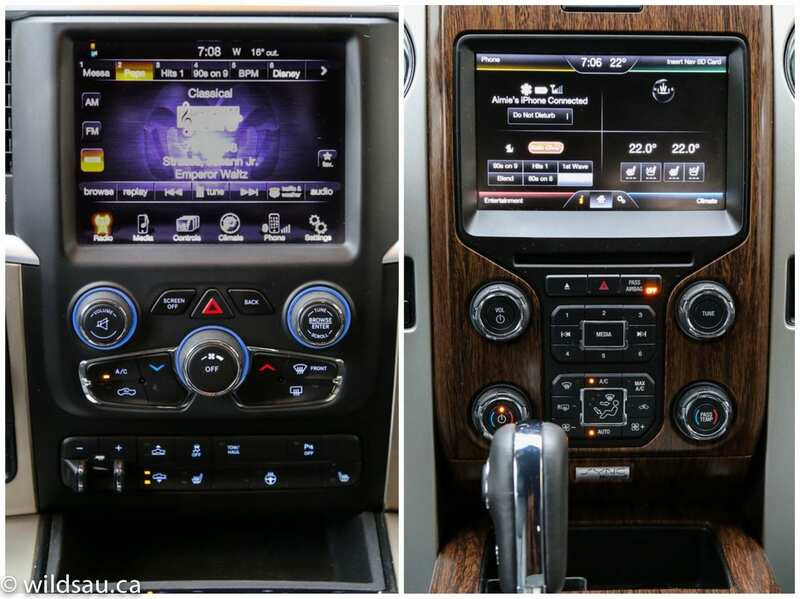 Up top is the ubiquitous MyFordTouch system, which manages phone, media, navigation and climate control systems. It’s not nearly as responsive as the Ram’s Uconnect. I also find it occasionally irritating because it buries some functions in the touchscreen system, such as heated/cooled seats. The Sony-branded sound system is very good! There’s a cleaned-up set of knobs and hard buttons below to control some of the major functions and below them, a dual-zone automatic climate control system. There’s a 12V plug on the dash, and the center console is home to the gear selector and some cupholders. Both trucks have fantastic backup cameras with audible rear parking sensors, automatic headlights, a universal garage door opener and a power opener for the center rear window. The Ford takes things up a notch, adding a power tilt/slide sunroof and power-adjustable pedals. Regular readers know I make a big deal about cabin storage – because I use it. All the time. It doesn’t matter to anyone, but if there’s one vehicle class where it probably matters most, it’s the truck. Trucks are used for work more than other vehicles and the places used to put things are important. The Ram has a dual (upper and lower) glove box, upper and lower door bins and great file folder bins on either side of the console. The armrest is absolutely huge – flip up the lid to reveal a shallow tray with two USB plugs and the aux plug – underneath that is another large open storage bin. 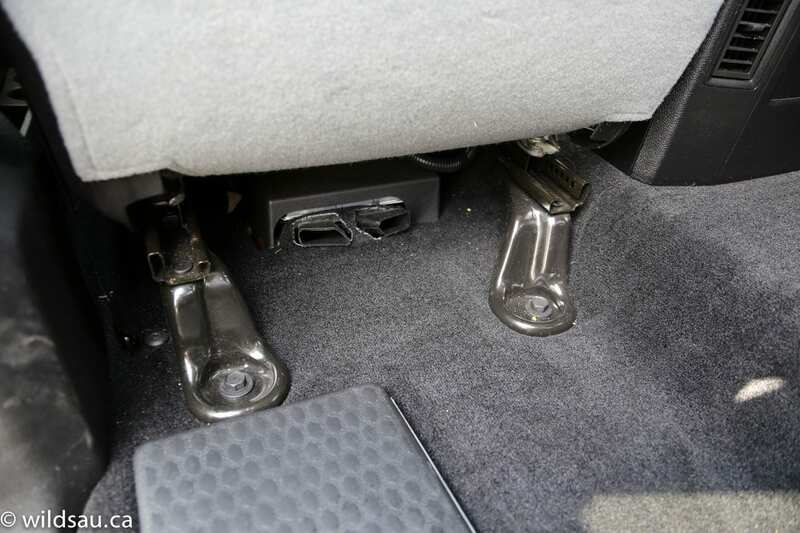 There are also numerous small drop-in trays and bins in the center console, as well as cupholders and a 12v plug. The Ram’s rear seats fold back and up, making for a very large space in the rear cabin. 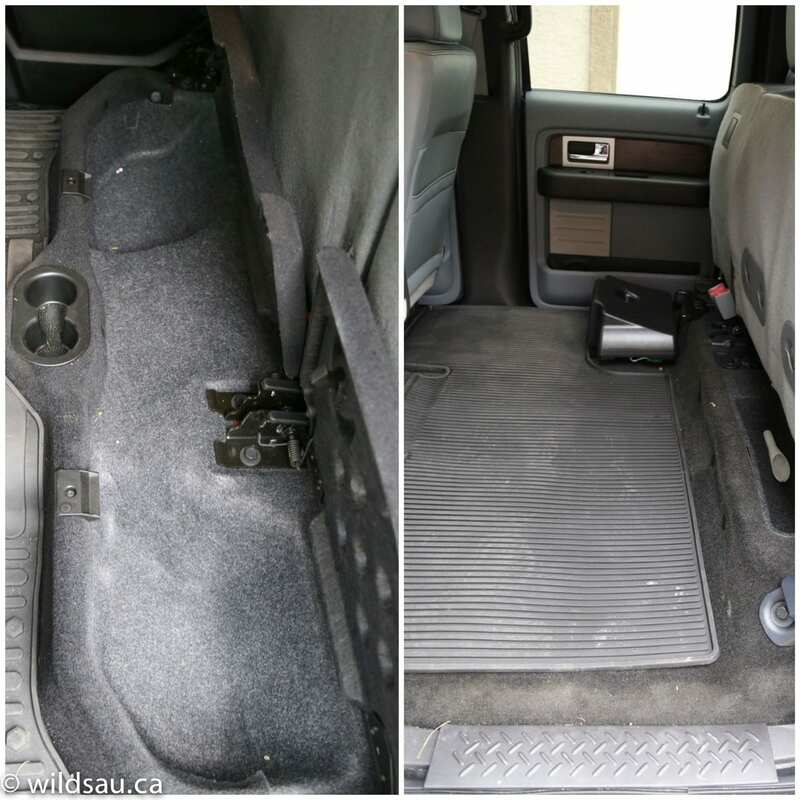 There are some smallish lidded under-seat storage bins as well as deep, lidded storage bins on either side. 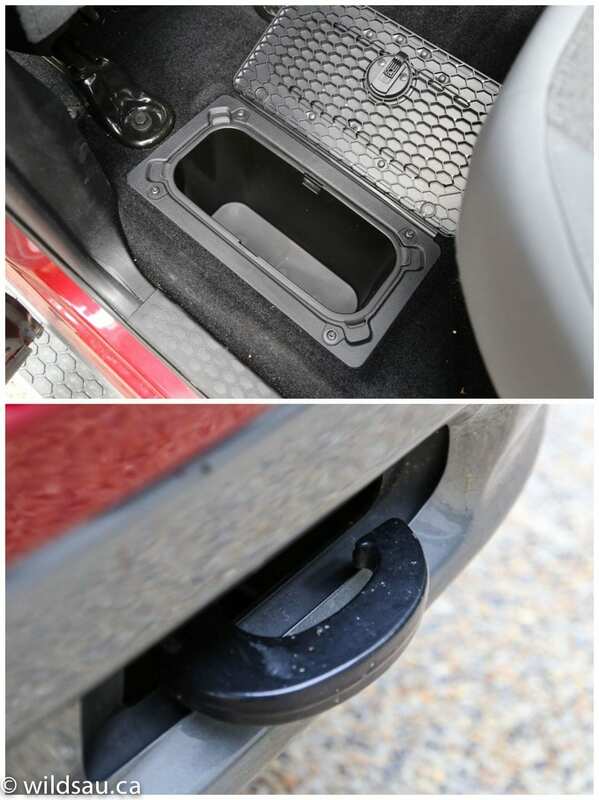 They’re accessible as you’re standing outside, but are under the rear floor mat. All in all, I found the Ram did a great job in helping the owner organize their stuff in the cabin. The F-150 does not offer as much in this department. There’s a small drop-in bin at front of console, decent door bins and a single glove compartment. Under the armrest lid (which is not nearly as wide as the Ram’s) is a cavernous storage space with one 12V and two USB plugs. 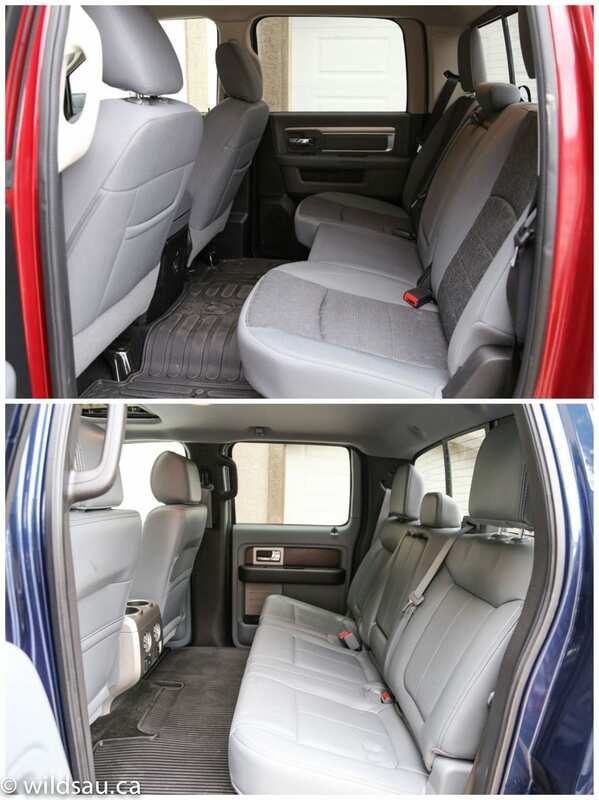 The Ford’s rear seats also fold back and up (both trucks offer a 60/40 split) to form a very large space in the rear cabin. Though there are no storage bins, the smooth, nearly unobstructed cargo space is simply phenomenal – you could move half an apartment in there! I say “nearly” unobstructed because of the Sony subwoofer under the seat which makes the space not quite flat on one side. It’s really a non-issue, I think. Both trucks follow similar recipes for the back seat. You’ll find three seats, three seat belts and three headrests. 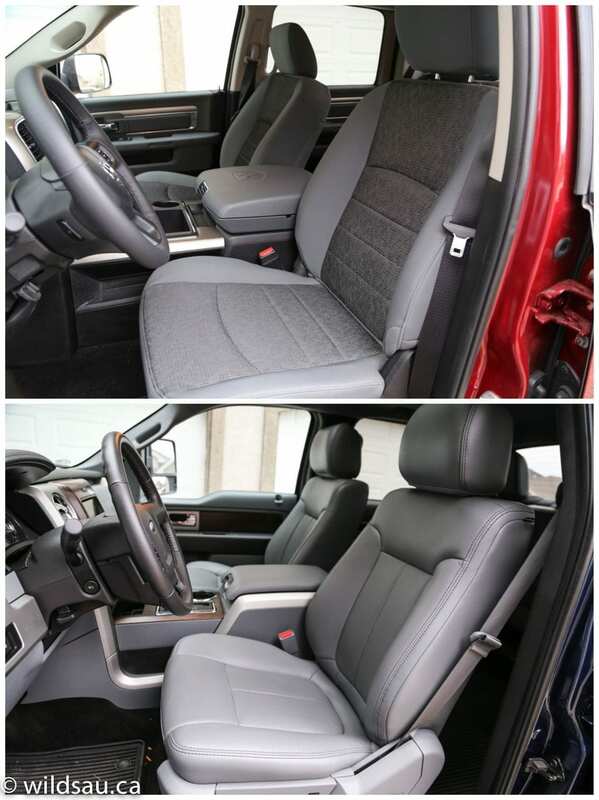 Both offer a load of head and leg room, though the F-150 has more of the latter. The middle seatbacks fold down to become armrests with two upholders and the rear of each center console has a 12V plug and adjustable air vents. Ford adds a 110V household plug (obviously a great feature) and the F-150’s rear headrests can flip down when not in use so they’re not blocking your rear view. One nitpick – the Ram has really nasty looking seat rails, seat anchors completely exposed rear floor vents – these are all highly visible from the rear seats and every single rear passenger commented on how bad it looked. None of those things are visible in the F-150. Around town, I really liked the Ram’s combination of the Pentastar and its eight-speed transmission. It has plenty of power and the shifts are imperceptibly smooth, though the drivetrain gave off some hints of coarseness. Obviously spacing gears closer together and having smaller jumps in RPMs helps. The ride was good, and I really found myself liking the Ram’s multilink, coil spring rear suspension. It’s still going to shudder over some of the harsher road irregularities and skip sideways over bumpy corners, but not nearly as much as you’d expect in a truck. It felt poised and always well-controlled which is more than I can say of most other trucks’ handling capabilities. Of course there’s also Ram’s active-leveling air suspension at all four corners. It can be lowered to help load the truck and raised a significant amount to facilitate some off-roading. Also it drops the truck at highway speeds to reduce drag and presumably help with fuel economy. Get on the freeway or highway, and you’ll find the transmission hunts a bit. It’s not bad, but it occasionally felt like it wasn’t sure where it needed to be. Also, the V6’s power is lacking when it comes to passing – you need to leave yourself some time and space to do that once you’re at higher speeds. The Pentastar makes some nasty noises when you step on it – I missed the V8 rumble. Other than that, it’s a pretty quiet truck under normal circumstances, though I noticed some wind noise at the A-pillars at highway speeds. I thought the steering was slick in terms of everyday driving. It’s quite boosted, but works well in the city. The brakes are powerful and do a good job hauling things down in the city. 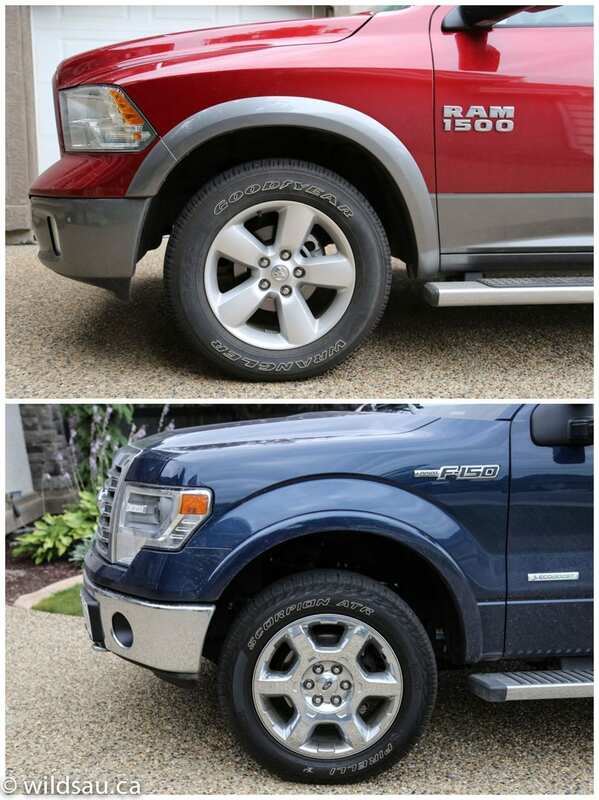 The F-150’s drivetrain offers up locomotive-like torque. There’s plenty of jam for every situation, and at every speed. The ride is fine, though not as refined or controlled as the Ram’s around town. It’s basically what you’d expect from a truck. Get it on the highway though, and it’s equally as smooth and settled. Somehow, after a week of driving, I found the combination of the EcoBoost engine and the 6-speed transmission to be a more refined combination. It just felt smoother through the seat and gas pedal. Though the transmission is down a couple of gears, it seemed to know its role and smoothly did its job. The F-150 can be shifted manually using a stupid thumb toggle on the gear selector. The Ram lets you lock the highest gear, so you can choose which of the 8 cogs will be your top one, pending on the job you’re doing. I found that less useful and versatile for my needs. I can’t let the EcoBoost get away with the sounds it makes either. Though it’s not quite as uninspired as the Pentastar, it doesn’t sound great, and the exhaust note is a flatulent mess. Trucks are often purchased with a specific job in mind. And one of those jobs is towing. The truth is, I’m not a truck guy. So I enlisted the help of one of a friend. He was willing to take time out of his schedule to not only help me drive both trucks, but also to allow us to use his 5000+ pound travel trailer for the towing test. Furthermore, he was happy to provide feedback on things that I would not have thought of. The Ram’s drivetrain allows for a maximum towing capacity of 2653 kg (5850 pounds). 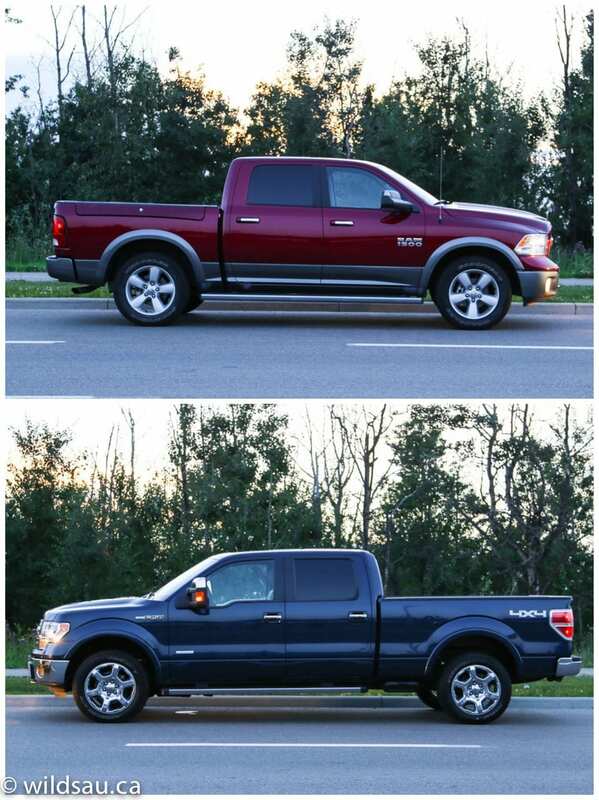 Though the F-150 EcoBoost’s numbers are clearly superior, I was still taken aback at the difference in ability. 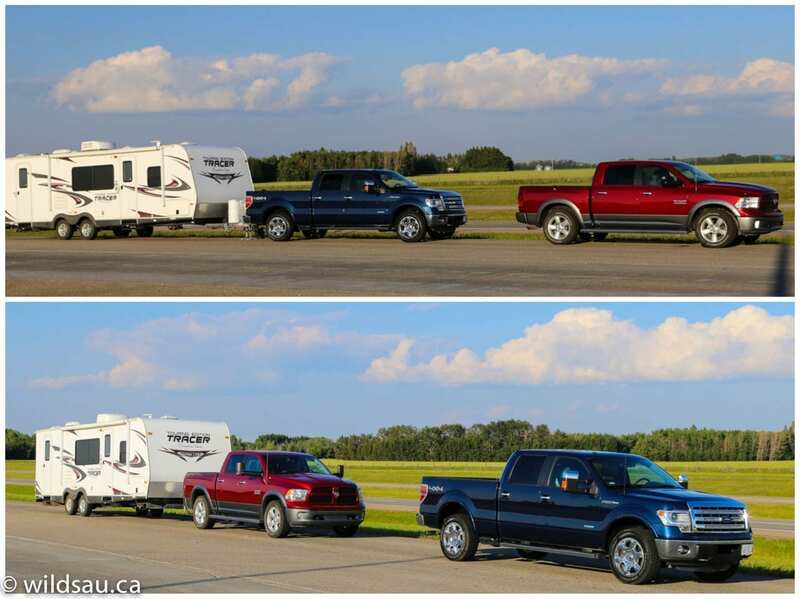 The F-150’s maximum towing capacity jumps up to almost double at 5126 kg (11,300 pounds)! Once we hooked the trailer up to each truck, we got on the highway and traveled just over 50 kilometres with each one. Acceleration, stability, braking and handling are all significantly impacted when towing this kind of weight, and we paid close attention to each area. I thought the Ram’s self-leveling did a great job at keeping the truck and trailer level – important to ensure the weight is distributed appropriately. Unfortunately, the Pentastar’s performance was underwhelming with this load. I realize it’s nearing its capacity, but it was clearly working very hard to get moving, and almost as hard to continue with its momentum on the highway. Most of the time, the engine sat at 4000 RPM on the highway – not great for the engine, and horrible for the fuel economy. The engine definitely got thrashy under load and sounded terrible. The suspension that works so well in the city felt completely unsettled on the highway with the load and came across as not having enough damping or rebound control. Same goes for the steering – what I enjoyed in the city became a liability on the highway, where the overboosting made things twitchy and required a lot of little corrections. That would get tiring quickly. I also noted that the Ram felt unstable while towing – it squirmed around a lot and was subject to serious buffeting issues – furthermore, once in a trailer sway situation, the engine didn’t have enough power to pull out of it. And finally, while towing, I wasn’t fond of the 8-speed automatic – it often felt confused and ended up in the wrong gear, especially in kick-down situations. The F-150 was very different. 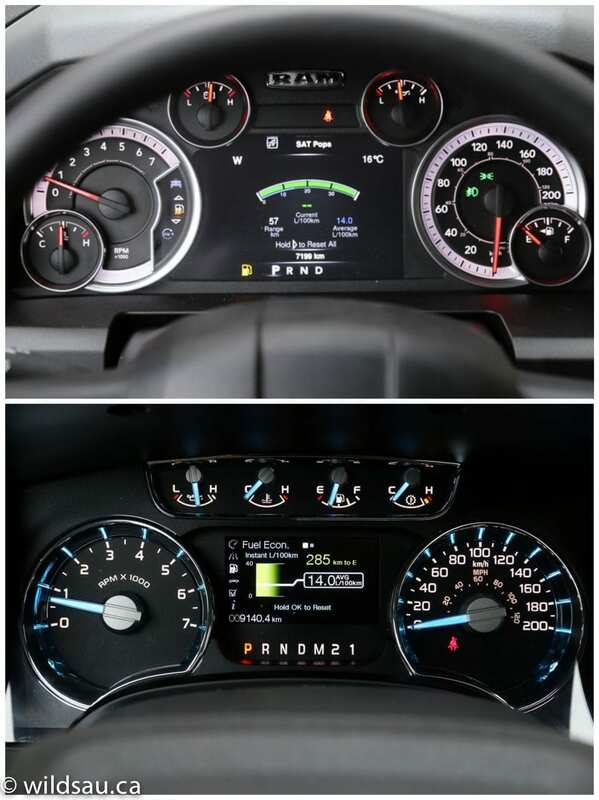 The EcoBoost authoritatively moved the truck and trailer at all speeds, even allowing for good highway acceleration. The transmission did a good job at choosing the right gear for the job, and though it has less gears, it happily gurgled along at 110 km/h, dropping the engine to less than 2000 RPM. There’s also high praise for the quietness of the cabin at every speed, the tailgate/side step innovations and the effectiveness of the Ford’s brakes, with and without the trailer attached. Ram expends considerable effort advertising their RamBox. This feature includes two large, drainable and illuminated compartments – one on each side of the truck box. They’re lockable (tied into the power locking system, just like the tail gate is) and are spacious enough to hold a number of power tools or personal effects, keeping them safe and dry. 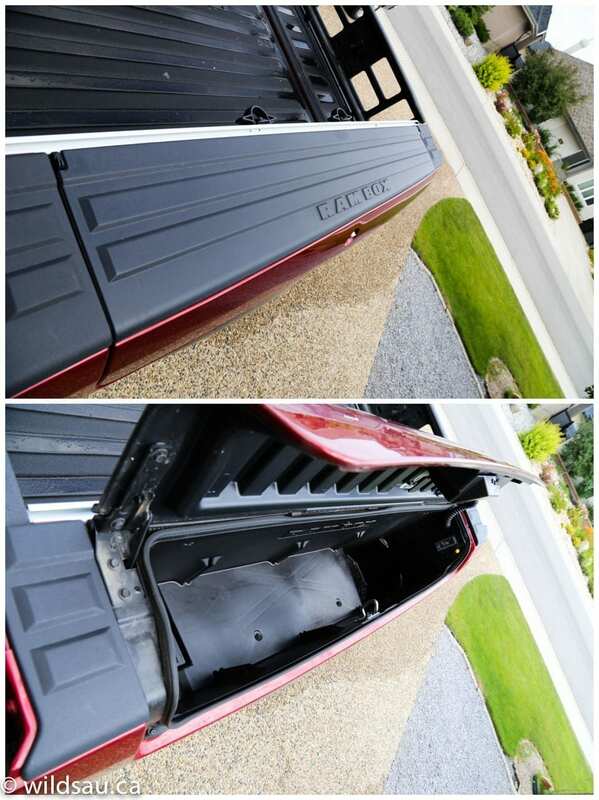 The Ram also had a cargo bed extender which can be used as a box divider, allowing you to customize the box area. The mirrors manually flip outwards to create taller extended towing mirrors. 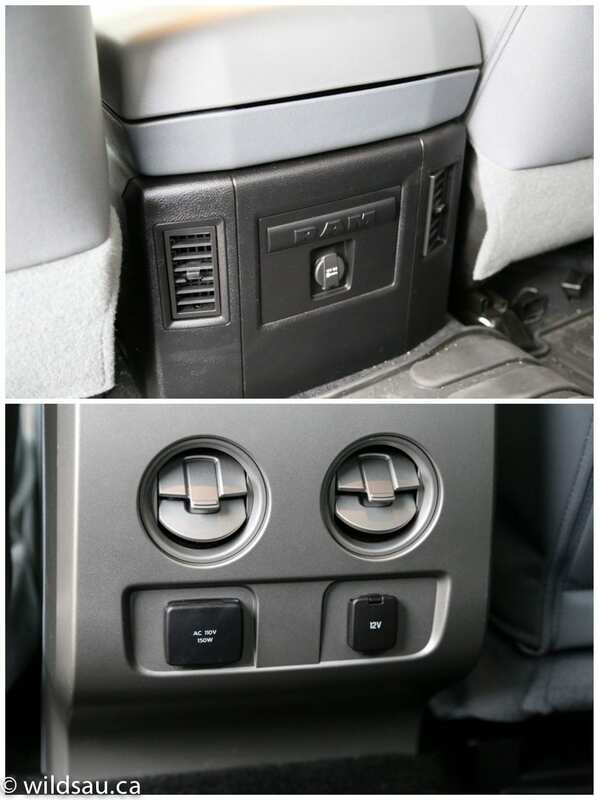 The 4×4 transfer case uses dash-mounted push buttons. 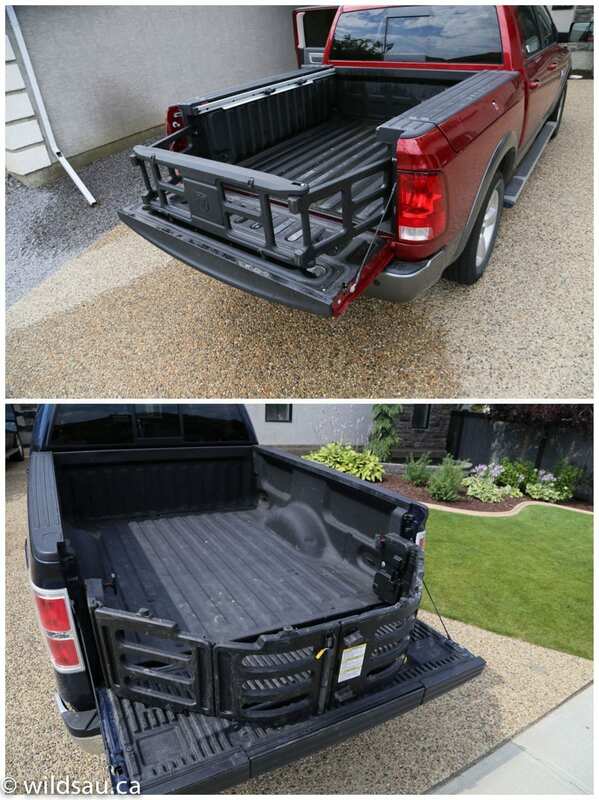 The F-150 has a bed extender as well, and throws in a few simple but highly useful ways to access the truck box. There are side steps that pop out behind the rear doors, allowing you to quickly step up. And the ever-handy step that slides out of the tail gate, complemented by the flip-up grab bar. Both features can seem goofy at first, but become totally indispensable. 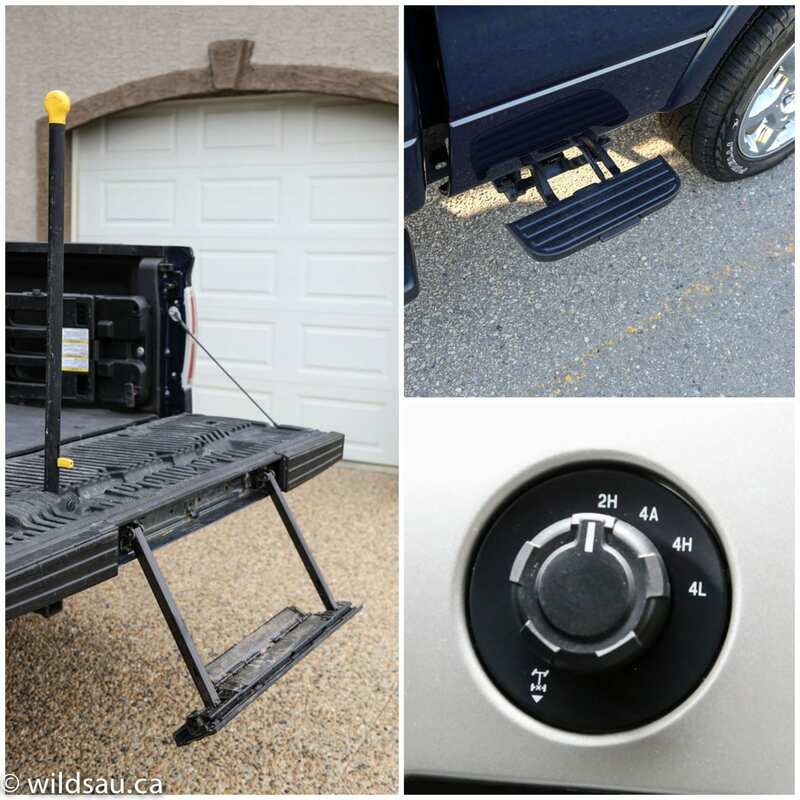 Getting into or just accessing the contents of the F-150’s truck box was infinitely easier and quicker than the Ram’s because of these simple additions. The Lariat also raises the bar with the mirrors – they’re power-folding (great for parking spots) and they’re power extending (great for towing). 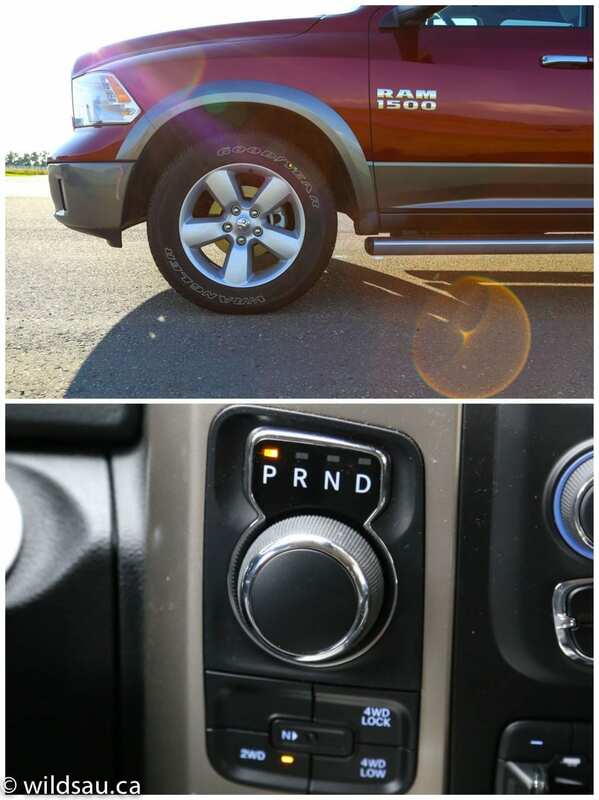 Ford’s 4×4 transfer case uses a rotary knob on the dash. Both trucks came with an integrated Class IV hitch receiver as well as standard 4- and 7-pin wiring harnesses, electronic stability control system with trailer sway control. Of course, they also have integrated trailer brake controllers with gain adjustment. I got some feedback from someone who knows trucks and it’s something I would have overlooked completely – the front tow hooks. He said the Ram’s are great, as they looked very solid and are open loops, allowing for the use of recovery straps and also being easy to use with gloves. The F-150’s, in turn, are a loop. That means you’ll need a shackle to use them, and he said their spindly construction definitely did not inspire confidence. 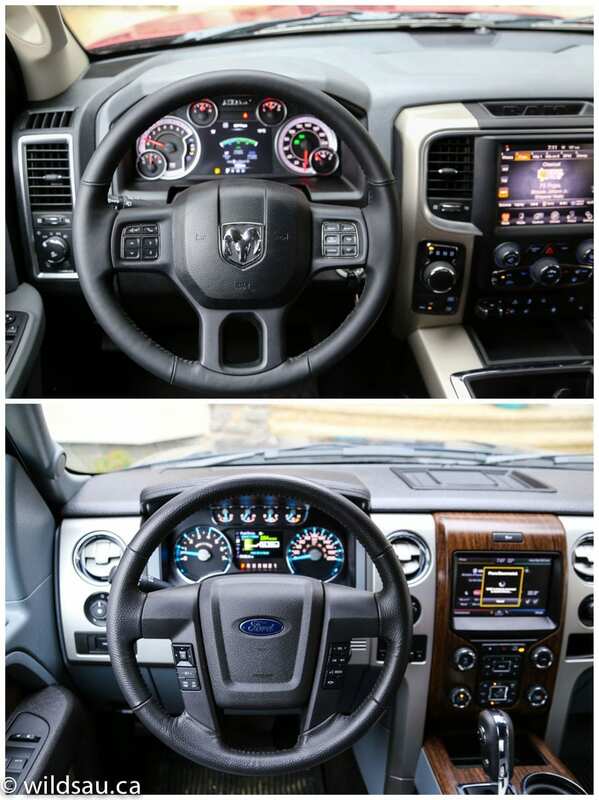 Though it’s not a direct comparison, the chance to drive a truck from Ram and Ford at the same time was a great insight into how the two companies go about things. The Ram brings some superior cabin technology, suspension refinements and advancements and modern drivetrain elements to the game. 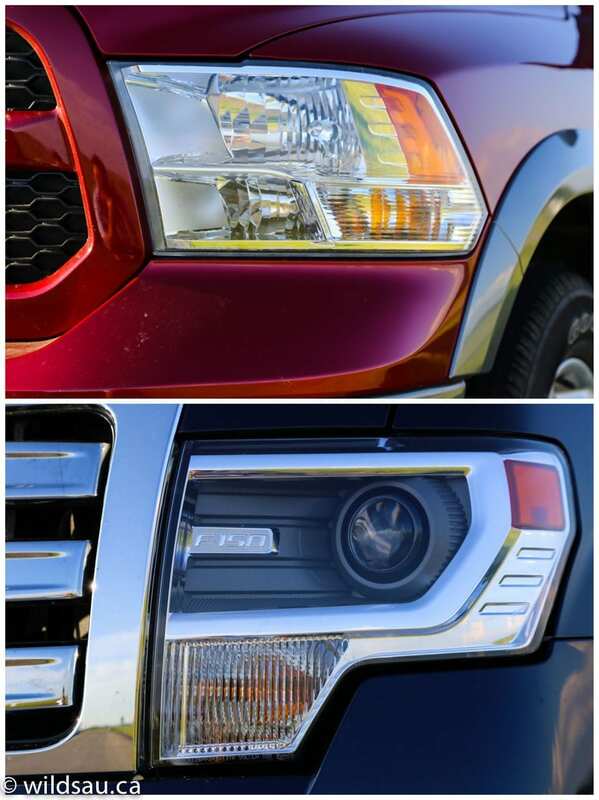 The Ford’s strengths lie in its refinement. The driving experience, especially when towing, was a better one – part of that came from the optional, upgraded engine. WAF (Wife Acceptance Factor) was no contest. 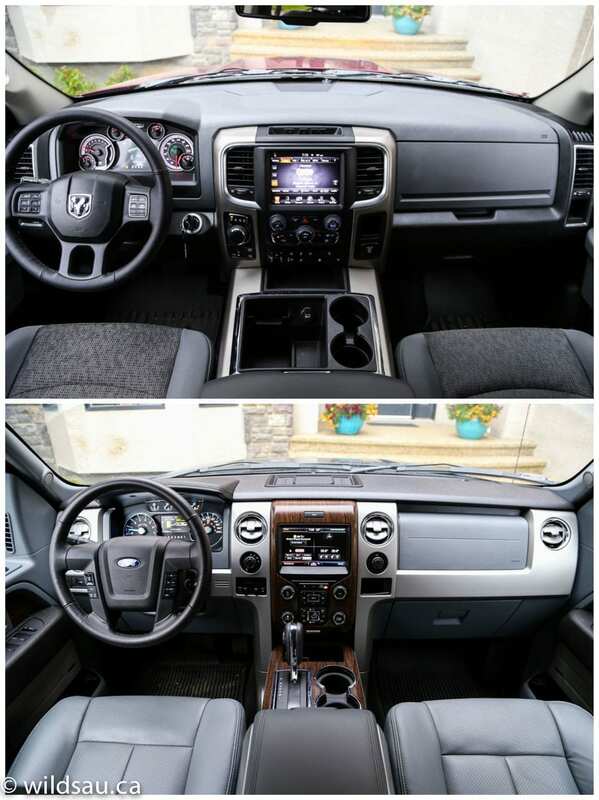 She preferred the styling, the interior comforts and the ride of the F-150 over the Ram. Given the choice, she said she’d pick the Ford in every department. I felt that the winner in every measurable category was the Ford F-150. OK, the F-150 was pricier, but that money goes toward goodies and gadgets. 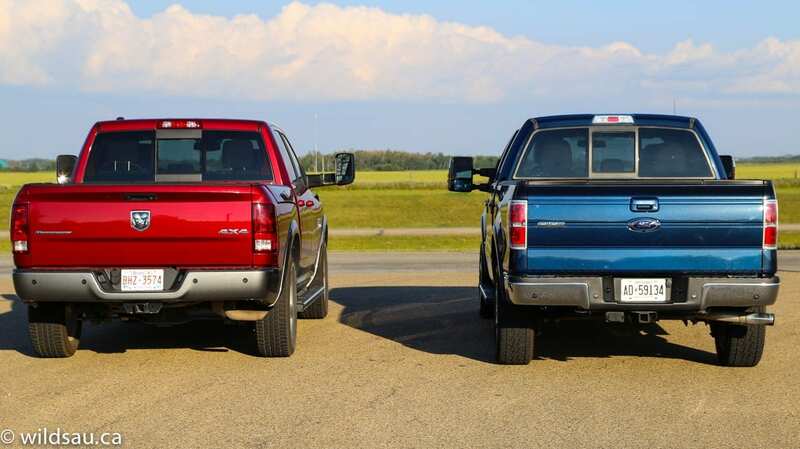 The same truck with the same engine can easily be bought for a price matching the Ram’s. Sure there are subjective categories such as styling and yes, the Ram’s available HEMI V8 might address some of the disparities in the towing category, but overall it still felt that the Ram has a ways to go to catch up to the leader. Are you looking to buy a new radar detector for your car? Check out the Top Radar Detector 2017 to protect yourself and your passengers on the road.